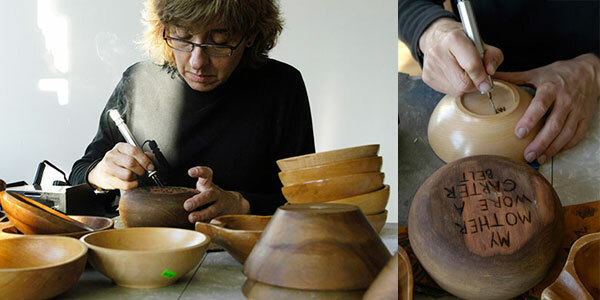 "My Mother's Legacy" is a 1,000 line poem wood-burned into the bottom of 1,000 wooden bowls. On each bowl is written a line from my memory that reflects a mannerism, advice, or a remark I attribute to my mother. The bowls are piled randomly onto tables, where the viewer must pick up each bowl to read it. The act of lifting each bowl reminds me of my mother, because she had t he habit of turning things over to see where they were made. When my mother died of breast cancer she was 47 and I was 13. Over the years, I carried around so many memory fragments that I could not fit together to fully understand who my mother had been as a person. In 1995 I began to write all the things I could remember. Out of that list came these lines that are "My Mother's Legacy".